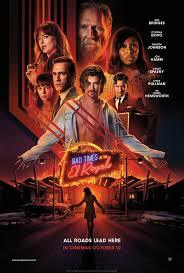 Plot: Seven strangers, each with secrets to hide, meet at the mysterious El Royale hotel at the junction of California and Nevada. As the night progresses, the strangers find out the hotel is not what it seems, and that they must survive one fateful night and either find the redemption they so desperately seek, or face eternal damnation. Popcorn and soft drinks provided.